After seeing Jean Wells at our quilt guild in March, I jumped at the chance to get 1 of just 4 seats left in her quilting class...seats that were added in at the last minute when Jean realized how large our rented space was. I did not have time to purchase fabrics or needed supplies and her book was sold out all over town. It just took a leap of faith to sign up and show up early the very next morning. And I'm so glad that I did! And while Jean is an excellent teacher, she truly does not tell you how to do the creative things or how to understand things but to simply learn by looking at what she has done and creating your own way of process. 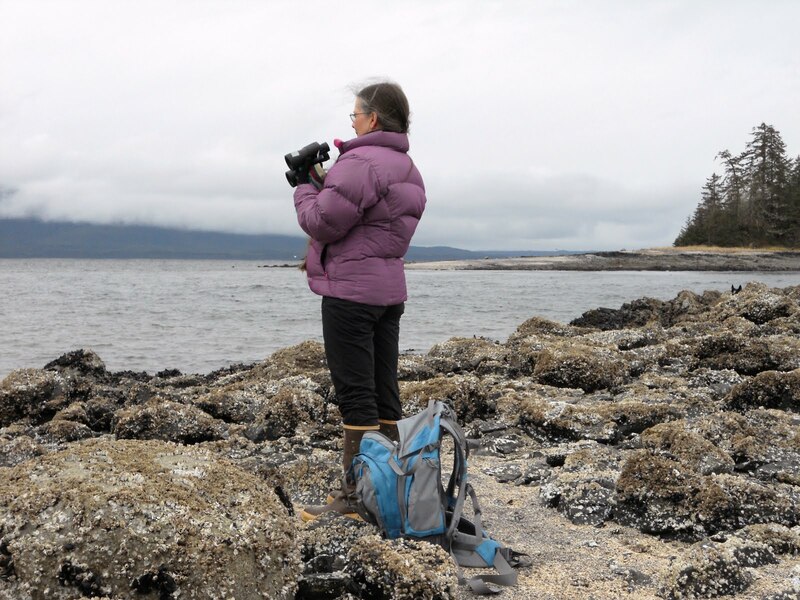 She gave us some truly excellent tips and ideas about looking at the world of nature around us and translating it into the feeling if not the actual reproduction in quilt form. Just look at her drawings of trees and how those trees can change and evolve...drawing by drawing into abstract design. She showed us some fabulous examples of her own works in progress and what fun to see those. Above she shows the back of a piece used to surround a front of a double layered quilt. You can see the sleeve at the top and a decorative piece for the back at the bottom. Here are her favorite 'stripes' done from her curved piecing and insert techniques. What I found most interesting...all of her quilts look worn, even a bit faded, and Jean is often asked if she pre-washes her fabric. She never has, and still doesn't. Yet, that's how her quilts all look....like they have been touched, and fondled, and almost become a part of the natural world all on their own! Above is Jean's class sample that she did not show us until all of our classwork below was finished. She wanted us to truly work intuitively...not copying her or seeking to please her, but to make it our own. Once we saw her work above, of course, it gave us so many additional ideas. The class members who managed to find and buy her book ahead of time had such an advantage over me as they had already explored the basic concepts. On the other hand, I felt lucky to be sewing 'cold' and using intuitive piecings every single step of the way...that's my excuse and I'm sticking to it ;) Above is my own curved piecing strips in process. 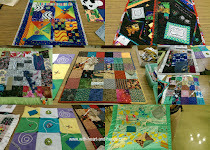 Our first curved piecing exercise (as seen above, double click to enlarge in Picasa album) used up a big chunk of our strips so we realized then that what was 'left' was more important than what we had first selected and as our instructions were...make 9 blocks of 9 patches each. One block is light center, dark logs; one is dark center, light logs...etc. etc....each new instruction and direction urged our own intuitive choices to grow more confident...we had no fabric and no time for redoing at all, no matter what! And she did give us two handouts...one on intersecting lines (back in Oregon with my fabric and sewing machine) one on tips for creating curved piecing using random cuts with a rotary cutter in curved shapes....note how you cut two at once(one on top of the other) with random curved rotary cutting and then flip and sew the two together for perfect piecing. 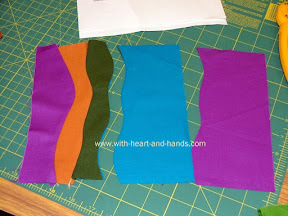 This is how you also make tiny insert strips that often look like curved piping...you just do it smaller! She had our class make intuitive 9 patches. Without knowing what we would be doing...she had us come up and select 5 color strips from a table piled high with many, many solids. I picked jewel toned brights, but many picked her own favorites of desert tones and they were beautiful later on when we discovered that our five choices plus one more..would be all we could use in our class project. She supplied the fabric strips and we simply paid her $3...no other fabrics we brought in could even be used. It actually took a long time to make the blocks above with so little actual fabric available to us, and she walked around and gave suggestions. Mine was...'you may be only making 6 blocks or maybe even 4.' She could tell by my colors and how I had used them in the curved learning piece how little I would have left and how hard it would be for me to come up with the necessary lights and darks required but not known about in advance. Somehow I managed! 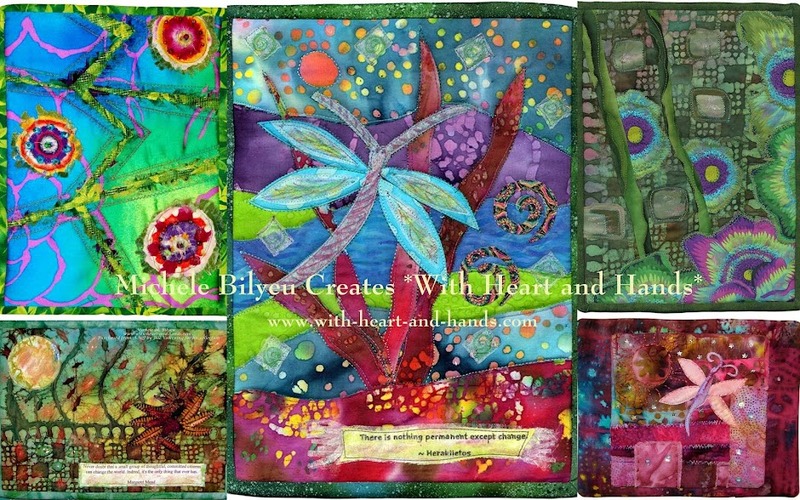 And while my jewel tones, might have been a bit typical in choice for me, they reflect my own spirit and desire for bright colors and richness in my life and I loved picking and sewing with them! Jean went around the room looking at our design boards and then called out that our time was up. And then she went around the room discussing what she saw in each of our work. Here are the others blocks from the class as she points out different ideas about each of them. In reality, the limitation of fabric and time created a natural abundance because we had to decide, had to quickly choose, had to cut and sew spontaneously without worry or decision changing. One 'mistake' and we would not have enough fabric or time, so nothing could be a mistake, every thing was an opportunity for another "creative opportunity." Look at the colors and imagine if you had only 5 colors to choose in a few seconds what you would have picked and how you might have put them together! Many used their original curved piecing block out of necessity as well as creative choice and our version of 'light' or 'dark' changed quickly, as well. Some of us had too little variation of lights and darks and suddenly we realized how choices we made in a hurry could affect the color and design of our pieces later...so every direction she made for us to do, and every piece of fabric or choice of fabric that we selected created definite outcomes in our collective sense of color and design and the future of each of our pieces! I can't remember all of the comments and there was no time to take notes...we were sewing as fast as we could but we truly did have a ball. I do remember Jean telling us that making a quilt is like writing a novel. You know who your main characters are, but you're not sure yet how the plot will develop. Well, the plot weakens, thickens, and then if you're lucky it all comes together in the end! It was great fun seeing everyone's color choices, though we all felt we needed to justify them in the beginning..haha. Jean seemed to love the unusual choices such as this one below..which she called 'fashion colors'. So, we all learned from her reaction to these colors that black and white can be striking choices in amidst what many might see as pastels, when alone. All in all, it was a great class, but working so quickly and from instant choices from 9 am to 3 pm...I noticed each and every class member put in a full day of creativity and we all went home truly tired (ok, every single person said exhausted ;) but very happy! Jean Wells Quilts...see her fabulous quilts that I got to see up close and in person. Phenomenal!!! Looks like such fun!!! I (oh dear) will have to go and hunt down her book! I think it is great to try classes on a impulse--if I think too much i usually don't do it!! I have the book - but honestly, I would have loved to have been in that day long hands on session with you (unprepared may have been the best part - sometimes I learn best in an unexpected (unplanned) situation). 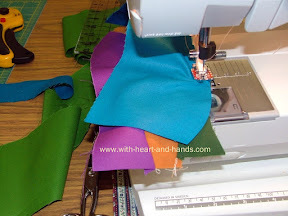 Thank you so much for this post and the previous one on Jean's quilts. I am in awe of her and have loved seeing and hearing about this. wow, what an amazing class. everyone came up with such terrific pieces.